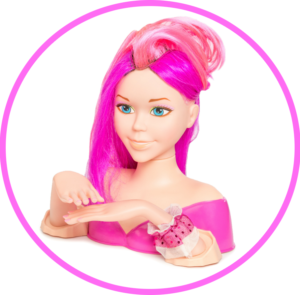 The Instant Glam Styling Head Doll Celebrates Creativity! The Instant Glam Doll is here to inspire kids of all backgrounds to express themselves and push the boundaries of their creativity. Our company encourages girls of all ages to enjoy a lifetime of fun and creativity! 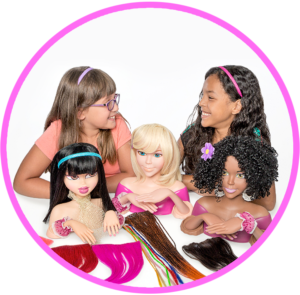 Our Instant Glam Dolls use innovative fastening technology that allow our customers to switch out hair extensions or change all the hair texture and color whenever they want however they want. Our customers delight in watching their children express themselves so productively and imaginatively.Our unique fastening technology allows you to create hot new hair designs over and over again in just minutes! How, you might ask? We use a Patented Fastening Head Surface System that allows you to attach and release each hair strip onto the doll’s head in just seconds. You simply lift a section of hair from the styling head to reveal the scalp. From there, you replace the hair by pressing on a new hair strip onto the doll head. You can replace the hair all at once or in sections for a new, creative style! Order your Instant Glam Doll today and get a 30 day money back guarantee!